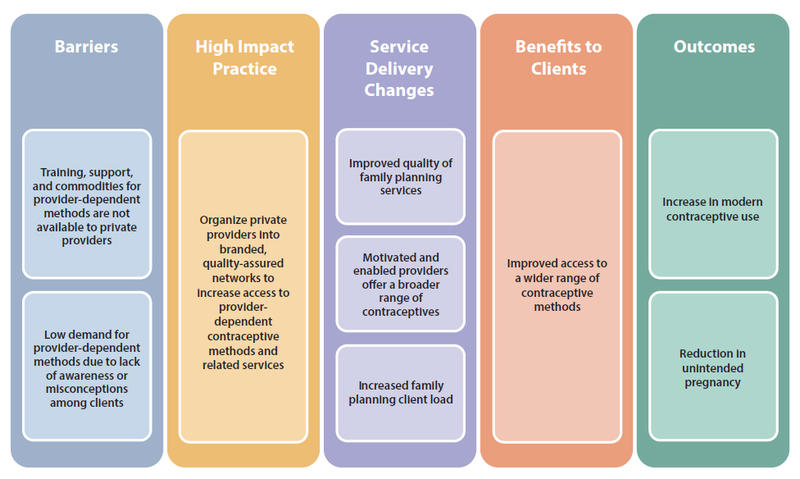 High Impact Practice:Organize private providers into branded, quality-assured networks to increase access to provider-dependent contraceptive methods and related services. A social franchise is a network of private-sector health care providers that are linked through agreements to provide socially beneficial health services under a common franchise brand.1 This type of network can be particularly important for expanding availability and improving the quality of family planning services in the private sector, particularly for provider-dependent methods such as intramuscular injectable contraceptives, contraceptive implants, and intrauterine devices (IUDs). This brief describes the potential impact of social franchising on key family planning outcomes. It also provides useful guidance on how social franchising can be used to increase access to high-quality family planning products and services. Even though private providers are a common source of family planning services, many do not offer a full range of methods. Independent private providers may lack training and support to offer provider-dependent methods; they may find commodities for these methods prohibitively expensive and accessing free or subsidized stocks difficult and time consuming; and some note low demand for these methods among their clientele (see Figure 1). Nonetheless, failure to offer these methods within the range of services available represents a missed opportunity to leverage existing health care infrastructure and client health-seeking behaviors to expand access to a broad range of family planning methods. Most social franchise networks are managed by a nongovernmental organization (NGO), referred to as the “franchisor.” The franchisor provides several benefits to franchisees, which often include clinical training, supportive supervision, and quality assurance mechanisms; business skills development and mentoring; access to affordable contraceptive and other health commodities; and support for family planning awareness raising and demand creation within the franchisees’ catchment areas.2-4 Franchisors often brand franchises to signal to clients quality and affordability at franchisee clinics. Social franchising is one of several promising “high impact practices in family planning” (HIPs) identified by a technical advisory group of international experts. A promising practice has limited evidence, with more information needed to fully document implementation experience and impact. The advisory group recommends that such promising interventions be promoted widely, provided they are implemented within the context of research and are carefully evaluated in terms of both impact and process. For more information about HIPs, see www.fphighimpactpractices.org/overview. Social Franchising Theory of Change | Context: A full range of contraceptives are not offered to clients of private providers. What challenges can social franchising help countries address? Social franchising can support coordination of independent private providers with public health systems in support of goals like Universal Health Coverage. A key component to most family planning social franchise networks is access to family planning commodities through government stocks. The process, which would be too difficult for individual private providers to successfully navigate, is managed by the franchisor. Accessing free or subsidized commodities enables franchisees to make a reasonable profit margin from family planning services while keeping service prices affordable for the client. These types of linkages between franchise networks and Ministries of Health are also a step toward better collaboration between public and private health sectors. Experts believe that social franchise networks can act as an “aggregator” of the private sector to, for example, link franchisees to national health insurance programs. In the Philippines, midwife-operated social franchisees are supported to become accredited by PhilHealth, the national health insurance program, to deliver contraceptives (and other services such as safe delivery) to insured clients, with reimbursement provided by PhilHealth.13 Similar coordination is taking place in other countries including Ghana, Kenya, and Nigeria. What is the evidence that social franchising programming is high impact? Evidence is unclear as to whether social franchising contributes to population-level increases in contraceptive use.4 Experimental studies in India,15 Nepal,16 and Pakistan12 found no statistically significant difference in contraceptive prevalence in communities before and after franchisee facilities were introduced. In Kenya, multivariate analysis found that women in communities with social franchisees were no more likely to be modern contraceptive users than women living in communities without social franchisees.11 Table 1 provides additional details of these studies. Social franchising’s contribution to increasing contraceptive prevalence was estimated using the Impact 2 model17 with data from a large international NGO that operates social franchise networks across the world (unpublished data from MSI and Avenir Health, 2017). Between 2012 and 2016, the median contribution to increasing national contraceptive prevalence among the 6 social franchise networks that participated in national health insurance or voucher programs was 0.88 percentage points (range: 0 to 1.59 percentage points). Among the 7 social franchise networks that did not participate in NHI or voucher programs, the median contribution was lower, at 0.39 percentage points (range: 0.10 to 2.59 percentage points). The social franchise network in Mali had the largest impact, with contraceptive prevalence increasing by an estimated 2.59 percentage points over 4 years. The program in Mali does not include vouchers nor does it participate in a national health insurance program. Uttar Pradesh, India15 Social franchise −3 percentage point net effect This social franchise model was not effective in improving the quality and coverage of maternal health services, including family planning at the population level. (N=5269) Social franchise Adjusted odds ratio (95% confidence interval) 0.95 (0.7, 1.2) There was no statistically significant difference in modern contraceptive use in the community with social franchise clinics compared with the community without. (N=1907) Social franchise +13 percentage point net effect Modern contraceptive prevalence increased from 45% to 50% in communities with social franchisees while control communities experienced a decrease in contraceptive use from 56% to 48%, resulting in a net change in contraceptive use of 13 percentage points. However, this change in use was not statistically significant (P=0.067). (N=5338) Social franchise −1.5 percentage point net effect Modern contraceptive use increased at nearly the same rate in the intervention (+4.7 percentage points) and control (+6.2 percentage points). (N=8995) Social franchise + voucher +23 percentage point net effect Modern contraceptive use increased significantly in intervention communities, from 18% to 43%, while control communities showed little change (24% to 26%). The cost-effectiveness of family planning social franchise networks remains undetermined. Studies in Ethiopia, Myanmar, and Pakistan have examined the cost-effectiveness of social franchising.20,21 However, differences in study approaches, methodologies, and measures make it difficult to draw generalizable conclusions from these works. Efforts are underway to standardize methods and approaches for more conclusive results. The following are common considerations for successful implementation of social franchising. Assess health market conditions. Social franchising is more likely to deliver intended results in markets where certain conditions exist, such as when the private sector is already delivering a substantial portion of health services and when the government is supportive of private-sector partnerships (see Box 1). Seek opportunities to engage large social franchise networks and geographic coverage. Larger networks benefit more from economies of scale with certain activities, for example, in procurement of health commodities and supplies, demand-side interventions, and marketing support. Additionally, a degree of regional focus allows supportive supervision to be conducted in a more cost-effective manner and supports cross-network learnings and referrals (i.e., interaction between franchisees). Recruit franchisees selectively. Successful franchisees must see value in franchise network membership, be motivated to expand their contraceptive service offerings, and be open and responsive to supportive supervision. With attention to equity, prospective franchisees should be located in lower-income catchment areas. Identify franchisees that have underutilized capacity to maximize health impact. Prospective franchisees should have the ability to increase the range and quality of services they offer and the capacity to serve more clients. De-franchising—that is, removing a facility from the franchise network—is sometimes necessary when franchisees are unable or unwilling to improve their quality to meet clinical standards or other franchise requirements. However, high rates of de-franchising point to poor initial franchisee selection and/or failure of the franchisor to deliver inputs that are valuable to the franchisee. Clarify expectations and commitments between franchisor and franchisee at the outset. A written agreement between franchisor and franchisee sets out defined quality standards, expected services available, and roles and responsibilities between parties. Agreements may also include the price guidance at which these services should be offered. Take into account client service volumes of each franchisee. Franchisee providers must serve enough clients and deliver enough services to maintain their technical skills and benefit from network-related increases in revenue. Furthermore, since ongoing supportive supervision of franchisees is resource-intensive, client and service volume are key for the intervention to be cost-effective. Many franchisors offer support to franchisees with clinic branding, marketing of franchised services, and family planning awareness raising at the community level. These interventions can help promote the availability of new services and grow and maintain family planning client volumes. Consider offering a broad range of services as part of the franchise package. IUD and implant services are the most commonly added family planning services when a clinic joins a family planning social franchise network. Currently, social franchising is not a major channel for expanding access to voluntary permanent methods because franchisee clinics tend to be staffed by mid-level providers who, in most contexts, are not permitted to deliver tubal ligation and vasectomy. However, looking forward, social franchising may present increased opportunities for permanent methods, especially in countries with task-shifting policy changes underway. Including non-family planning services in the package of franchised services can also present a strategic opportunity. Franchisees may be better positioned for inclusion in national health insurance programs when a broader package of services is offered. What is the effect of social franchising on contraceptive prevalence in communities served by social franchise clinics? What is the differential impact on contraceptive use of social franchising with and without a voucher component? What are the associated costs with maintaining a social franchise? This brief was written by Sarah Thurston, Elaine Menotti, and Shawn Malarcher. Critical review and helpful comments were provided by Michal Avni, Joe Bish, Luke Boddam-Whetham, Paata Chikvaidze, Tamar Chitashvili, Megan Christofield, Kimberly Cole, Ramatu Dorada, Hillary Eason, Ellen Eiseman, Gillian Eva, Mario Festin, Sarah Fox, Kate Gray, Anna Gerrard, Denise Harrison, Dana Hovig, Roy Jacobstein, Joan Kraft, Ben Light, Anna Mackay, Baker Maggwa, Ados May, Erin Mielke, Dani Murphy, Alice Payne Merritt, John Pile, Pierre Moon, May Post, Caroline Quijada, Jim Shelton, Martyn Smith, Nandita Thatte, Caitlin Thistle, Caroll Vasquez, and Matthew Wilson. This brief is endorsed by: Abt Associates, Bill & Melinda Gates Foundation, CARE, Chemonics International, EngenderHealth, FHI 360, FP2020, Georgetown University/Institute for Reproductive Health, International Planned Parenthood Federation, IntraHealth International, Jhpiego, John Snow, Inc., Johns Hopkins Center for Communication Programs, Marie Stopes International, Options, Palladium, PATH, Pathfinder International, Population Council, Population Reference Bureau, Population Services International, Promundo US, Public Health Institute, Save the Children, U.S. Agency for International Development, United Nations Population Fund, and University Research Co., LLC. The World Health Organization/Department of Reproductive Health and Research has contributed to the development of the technical content of HIP briefs, which are viewed as summaries of evidence and field experience. It is intended that these briefs be used in conjunction with WHO Family Planning Tools and Guidelines: http://www.who.int/topic/family_planning/en/.